The departure of Design Council CABE director Nahid Majid was inevitable, and coming only a short time after Tony Burton’s departure. Though even tweeting ‘The Last Person Out Turn Off the Lights’ about it today got me an invite for coffee from the Design Councils director John Mathers (sadly im in Uganda where the coffee is so much better). CABE is now gone. Its now Design Council with a Design review department. The policy function has gone like that in most other quangos. They can no longer criticsise government on design as government thinks its is its jobs to criticise quangos and procurement of cheap modular design free buildings, like Gove’s box academies is the in thing. The reissuing of the Building for Life Standard whereby boxy houses and car dominated layouts are now acceptable was simply an exercise to please and not of independent design thinking. According to the survey of more than 2000 people, 54 per cent of respondents claimed plans to temporarily double permitted development limits for extensions to homes would damage the quality of the design of their neighbourhood. It comes after architects warned that the government’s new housing proposals could see the profession stripped of its role in designing house extensions and the RIBA raised concern that further planning reforms could undermine design quality. The poll also revealed that the planning reforms have left half of public respondents worried about losing their influence over new extensions in their local area, with 20 per cent very worried about the changes. Only 10 per cent are not worried at all. The institute claims the lack of public support for the measures mirrors its own concerns and that the proposals ‘go against the principles and commitment to quality design’ set out in the recently introduced National Planning Policy Framework (NPPF). On the back of the findings and the ‘significant professional concern over the flawed proposals’ the RIBA has called on the government to ‘ensure adequate safeguards are put in place to prevent poorly-designed new extensions’ and to ‘consider the private cost to future owners who may need to rectify mistakes of poorly designed extensions built without appropriate checks and balances’. Former RIBA president and the chair of the institute’s planning group, Ruth Reed said: ‘The government’s new policy is rushed and if implemented could pave the way for poor design decisions which could damage our built environment for years to come. Commenting on the survey results, Kate Henderson, TCPA chief executive added: ‘An effective and efficient planning system must balance economic imperatives with social and environmental justice – it must also be transparent and democratically accountable. 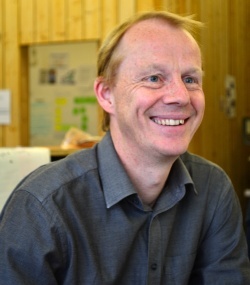 Councillor Peter John, leader of Southwark Council, said: ‘We don’t believe that policy is a barrier to progress;demonstrated not only in the homes to be built as part of our regeneration plans and in the landmark buildings which now exist on the London skyline, but in committing to build 1,000 new council homes too at a time when this is considered virtually impossible by some authorities. Is Burton Sacking from Design Council a Decision No Longer to influence Government? Design Council Cabe’s departing policy director has revealed the internal tensions that are threatening to overshadow its future. Tony Burton, who was made redundant earlier this week, said the forced marriage of the two bodies 18 months ago remained rocky, and he warned that with his departure the organisation was “singularly lacking” in key areas of expertise. Burton told BD there was now no one in the organisation with experience of public affairs and public policy, and that this risked undermining what made Design Council Cabe unique. Burton said many of the problems were rooted in its failure to integrate the Cabe and Design Council teams and trustees into one body with a clear sense of purpose and identity. “It’s very hard to think how it can strengthen itself when you have two organisations still looking back to a time when they were both part of government,” he said. Burton made no secret of his frustration at being made redundant just six months after being head-hunted from Civic Voice. He was given his marching orders last Thursday, the day his probationary period ended, by chief operating officer Madeline Denmead. She said his role overlapped with that of the new chief executive, John Mathers, whose appointment was announced the following day. Meanwhile, other former Cabe staffers privately told BD they were stunned by the move which, they said, suggested the Design Council had made a corporate decision no longer to influence government. A Design Council spokesman insisted the skills of the new executive board meant Burton’s policy and communications brief was covered. New chief executive Mathers, whose background is in branding and marketing, joins from the Holmes & Marchant design agency and, before that, Safeway. The worlds worst property developer Peel has gained its first South of England planning consent for a 5ha Mixed use scheme at Chatham Docks granted last week by Medway after 2 years discussion. Quite unlike their North of England monstrosities however they have used good architects 5 plus – plus a good masterplan which shows some coherence of form, urban structure and interplay between land and water. Is it that in the south unlike the north they know cllrs will not automatically roll over isn desperation however ugly the scheme but will instead demand some quality? Today we’ll cover chapter 9 of Raymond Unwin’s ‘ Town planning in practice; an introduction to the art of designing cities and suburbs‘ of 1909. Unwins begins the chapter with a discussion of the victorian by laws which allowed development of tight terraces with rear yards of only 25′ depth – which with narrow frontaged cottages Unwin considered inadequate for health and comfort. It is not possible to fix any absolute limit for the number of houses to the acre which can be regarded as a maximum compatible with health and comfort. Very much depends upon the size of the houses and their arrangement. It is not easy yet to weigh the disadvantages that might arise from enlarging our towns to such an extent as would give a much lower number of houses to the acre all through, but one may safely say that, according to circumstances, the desirable number would be between 10 and 20 houses to the acre, and in this case I refer to the net measurement of the building land, excluding roads. There will necessarily be areas in the centre of towns where buildings will be crowded to a greater extent than this figure would suggest ; but in any district where cottages are likely to be built it should not be necessary to exceed the maximum number of 20, and wherever possible the number should be reduced to 10 or 12. The figure of 12 DPA is often given as a rigid maximum for ‘Garden Cities’ but you can see that Unwin was not that rigid, especially for areas at the centre of towns. Indeed 12 DPA is not that low a density, especially when compared to sprawling American and Australian suburbs. Indeed 12-20 DPA magically comes out at 30-50 DPH, exactly the recommended minimum density ranges from the old PPG/PPS3. And we know that even large family dwellings can be provided at 50 DPH where 2-33 storey terraced townhouses are used, as at Bedzed. We also know that family housing can be provided in streets appearing as single family dwellings at 100DPH if certain ‘old urban’ techniques are used, as in the Swedish new town of Jakriborg, which is very similar in form to the kind of central city plans that Unwin favoured. 12 DPA was the favoured number simply because of the practicalities of cultivation as it was an essential supplement to labourers wages, such considerations are less important today as not eveyon will cultivate and accessible allotments may in many circumstances be preferable to excessively large gardens which we now know in social housing will simply see quite a large proportion left untended. Twelve houses to the net acre of building land, excluding all roads, has been proved to be about the right number to give gardens of sufficient size to be of commercial value to the tenants — large enough, that is, to be worth cultivating seriously for the sake of the profits, and not too large to be worked by an ordinary labourer and his family…. it is only the average number of houses to the acre that needs to be very carefully considered from the point of view of health, the exact size of each garden being a matter of comparative indifference. 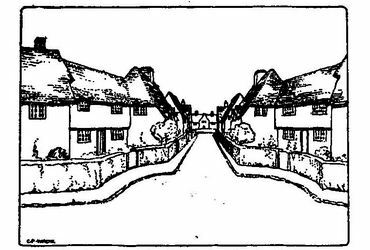 This figure of 12 houses to the acre has now been fairly well tested, having been adopted in the main at Bournville (although here there are some larger gardens), at Earswick, at the Garden City at Letchworth, at Hampstead, and at many other places. That a greater number of houses to the acre than 12 may be planned, and yet produce a healthy suburb is proved onthe estate of the Ealing Tenants and many others. in terms of cottages Unwin recommended a minimum frontage width of 15 feet for two bedrooms (4.6m) and 18-20 feet for three bedrooms (5.5-6.1m), varying depending on aspect. For plots 150 feet deep and 12 houses to the acre an average frontage of 24 feet is obtained (7.3m). This leaves 100 yard (91.4m) distances between parallel roads. If there was a significant reduction in these distances then any variation in grouping would bring houses too close together at the back. Unwin talks of the Garden City (Letchworth then) bye laws where one rule was that the building occupied no more than 1/6th of the site. With exceptions for shop and corner sites. Unwin was critical of the ‘apparent economy’ of narrow long plots as crossing roads in between permiter blocks (as we would call them today) become longer. He also to the type of dark bye law house with ‘long projections running out behind’. The architectural term for these is outriggers. It is quite a mistake to suppose that it is always economical to put the maximum number of houses which can be contrived on any space…Cases may frequently occur where the loss of ground to provide an additional cross road to open up the centre of some area of land, and the cost of the road itself, when taken together are not compensated for by the increased value of the central area of land thus developed, and it may often be wiser to reduce slightly the number of houses to the acrerather than to cut up the land with too many roads. Of course this was the key argument in his fanmous 1912 pamplet Nothing gained by Overcrowding. Today the argument requires some modification as the house /road cost ration is somewhat different and the key argument is now not losing to roads what land could be used for housing. Of course where inexpensive, subsidiary roads such as have been used in the Hampstead Garden Suburb estate are allowed, it would be possible to utilise this area of land to form a green in front J of the houses on the main road, thus producing an attractive feature in the road, and at the same time securing an additional number of houses by the increased frontage provided around the green. Though here we have the invention of the cul-de-sac there are four critical variances from modern culs-de-sac non grid layouts, secondly they were for Unwin subsidiary elements, seodnly they did not force a tree form of layout, thirdly they were often car free with central greens, and finally they fiten had filtered permeability to allow pedestrian access to the other side of the permiter block. A critical element of housing design for Unwin, sadly almost never utilised today was to vary the housing layout and housing plan by aspect to optimise sunlighting and ensure principal rooms gained sufficient sunlight. Sadly most architects today seem to have had no training at all in site planning and such issues seem like a bolt out of the blue revelation when you do mention it to them concerning the laying out of a site. Unwin was a great critic of the ‘platting first’ approach to site planning, sadly prodominent especially in American planning. We might call it Unwins ‘buildings first’ law of town planning. it is the buildings which must be the primary consideration in laying out the site ; so much so that the designer, if he is wise, will lay out his buildings roughly, not only before he considers the division of his plots, but before he fixes the exact lines of his roads. If he is content with merely cutting up his spaces into what he will ‘ lettable’ plots, there is little likelihood of any beautiful result or satisfactory group ing of the buildings which will be placed on them. Having laid down approximately the position of the roads, the right placing of the buildings must then command his attention; he must decide on the main building lines and masses, placing any important features in his design, such as the terminal feature at the end of a road, or any buildings required to limit the size and give a sense of frame to the street picture which he is dealing with. Having placed his buildings roughly and decided on the general picture which he is desirous of obtaining, it will be time enough then to consider the plotting of the land, working from these important and fixed points. It is usually easy to adapt the boundary lines of the plots to suit the buildings, much easier than to adapt the arrangement of the buildings to any preconceived plot lines. Nothing more thoroughly expresses the shoddy character of our modern town development and the meanness of the motives which have inspired it than the treatment of the spaces at the backs of buildings. It seems to be forgotten that from all the houses around such a space the outlook of the inhabitants must be on to the backs of their neighbours houses opposite, but just because these are not seen from the public street outside all attempt to make them even passably decent according to the excessively low standard which governs the fronts of such buildings has been neglected. The removal of the excessive back projections will of itself be a great improve- ment, but a little care in the arrangement of the houses and in their design may very often make the spaces at the backs as beautiful as or even more beautiful than the fronts. Unwins approach to ‘attractive outlook’ from houses was thoroughly democratic. it is for the site planner who is engaged in laying out sites for smaller houses, where each cannot stand in large grounds of its own, to secure for as many as possible of these houses some extent of outlook by arranging breaks in the street line, by setting the houses back round greens, by planning his roads so that they may command some distant view or may lead on to some open space ; and wherever a specially fine view is obtainable, by grouping as many of the houses as possible so that they may enjoy it. Hampstead Garden City being a great example of how Unwin maximised view of the Heath Extension. . The usual modern bye-laws as to open space, requiring as they do that this space shall oe at the rear of the building, and making little or no provision for corner sites, has resulted in the production of the most unsatisfactory treatment of street corners ; and their ugliness has been exaggerated by the want of care in the treatment of the ends of the buildings at the corners of side streets, Some liberty should be allowed in the treatment of corner sites. Not simply in terms of creating his famous ‘street pictures’ but in terms of economy of layout as where two streets meet rear garden space can be squeezed. Unwins solution is the famous garden city open areas at corners, including sometimes houses angular to corners substituting side and frontage space for squeezed rear gardens. Unwins treatment of this issue is supplemented by a considerable number of illustrations of possible corner treatments and I can only recommend reading the original on this point. The tendency of the modem individual has been to build his house in such a way as to emphasise its detachment and difference from its neighbours, but no beauty can arise from the mere creation of detached units. So long as we are confined to the endless multiplication of carefully fenced in villas, and rows of cottages toeing the same building line, each with its little garden securely railed, reminding one of a cattle-pen, the result is bound to be monotonous and devoid of beauty. It must be our effort to counteract this tendency and to prove that greater enjoyment to each householder can be secured by grouping the buildings so that they may share the outlook over a wider strip of green or garden — in fact, that by some degree of co-operation more enjoyment of the available land can be secured than by dividing it all up into individual plots, and railing each in. Indeed Unwin was not a fan of front fences, they secured little in the way of privacy or protection from dust. He had seen the American tradition of open frontages and much admired them, although acknowledging that to the English enclosure was an essential feature of the garden, so naturally he preferred hedges and shrubberies instead. Today we’ll cover chapter 8 of Raymond Unwin’s ‘ Town planning in practice; an introduction to the art of designing cities and suburbs‘ of 1909.
in site planning the first consideration will be the arrangement of the buildings and the development of the site to the best advantage, whereas in town planning the first consideration must be the general convenience of the town, and the arrangement of the main roads. When the main roads have been laid down and the main traffic requirements have been provided for, the spaces left between these through roads can be developed more from the point of view of making the best of the sites for the buildings, and less from the point of view of public convenience…. To what extent do they interplay? it is impossible when dealing with a plan of a very large area to take full advantage of each individual site, or to give sufficient time and play of fancy and imagination, to produce the best result. It may, indeed, be helpful when engaged in town planning, to work out tentative site plans for different areas. It may, for example, be necessary to do this to see whether the larger parcels of land, which are left between two main roads, are of such shape and size that they will cut up economically for building purposes ; but such tentative schemes if prepared should be left open for revision by the site planner when he comes to deal with them. My experience has been that when the town planner him- self becomes the site planner, and concentrates the whole of his thought on one portion of the site, arranging buildings and open spaces upon it, he can generally improve considerably in detail on the preliminary scheme sketched out in connection with his town plan. It has been too common for site planners’ to work out their plans on paper only, and to save themselves trouble by clearing away trees and hedgerows, wherever these happen to come in the way of the plan. No system can be more foolish, for a new building estate, at best, looks raw and poor, the gardens empty or filled only with small struggling shrubs and plants ; and nothing so helps the early appearance of a building site as the preservation of, existing trees, and even sometimes of existing hedgerows. In planning out a site, whether large or small, one of the first considerations should be to determine the centre point of ‘the design. In any but very small sites there are likely to be required some buildings of a larger or more public character than the dwelling-houses — such, for example, as churches, chapels, public halls, institutes, libraries, baths, wash-houses, shops, inns or hotels, elementary and other schools ; and it would probably be well, having decided which, if any, of these are likely to be required, to group them in some convenient situation, and of them to form a centre for the scheme…. In the case of shops and refreshment-houses, the requirements are rather different, the essential thing being that they should front to the roadway which has, or is likely to have, the greatest amount of traffic passing to and fro. Shops, moreover, generally succeed best when in groups of a sufficient number to form what is known among the shopkeepers as a ‘ market ‘ ; odd shops scattered about are not liked. Sometimes it would be best not to attempt anything in the way of a centre beyond a portion of wide roadway, which might contain shops and a few public buildings, on the lines of the main village street with which every one is familiar. In other cases it may be possible, while keeping the shops on the main streets, to develop opposite them a green or square around which some of the other buildings may be grouped ; but whatever be the form, there can be no doubt of the importance, even on small sites, of having some central feature up to which the design may lead. This is one of the few sections where Unwin goes beyond aesthetic considerations to talk of teh conveniences and benefits of walking connection’s, here referring in the concept of a ‘market; what today we would call linked trips. types of beauty must be sought which do not clash with strong prejudices or desires on the part of future householders. This will often lead to a greater degree of openness in the spacing of the houses than from a purely architectural point of view might be desirable. But here again it may be possible, by grouping buildings, for them all to command a wider outlook ana have a more general sense of space than could be obtained by scattr them ; and it may easily be possible to reconcile those whose first idea would be to secure a detached house in the middle of its own plot of ground, to taking a house forming one of a group, if the grouping is so arranged that there is obviously a considerable gain in the matter of outlook. If the creation of street pictures, which we looked at in the last chapter was Unwin’s first lw of town planning then the following was his second. It is far safer, whether one’s plan leans to the formal or informal, to do nothing for which one has not good reasons. We may well remember the value of little open spaces, spots where folk may repair from the bustle of the street to stop and rest awhile ; very small spaces may serve such purposes. Playing places for children may often be secured in the centres of building areas, which without the making of an additional and costly road would be of little value for building purposes; points too where fine views are obtained, and where the sunset can be seen, can often be preserved by the devotion of a very small area of ground and would add much to the pleasure to be obtained in the district. Both in town and site planning it is important to prevent the complete separation of different classes of people which is such a feature of the English modern town…. It is not within the power of the town planner to alter the prejudices of people, or to prevent entirely the growing up of the East End and West End in a town ; but a good deal may be done in this direction by care and forethought ; certainly within limits, more or less wide, there is no difficulty in mingling houses of different sizes. There is nothing whatever in the prejudices of people to justify the covering of large areas with houses of exactly the same size and type. The growing up of suburbs occupied solely by any individual class is bad, socially, economically, and aesthetically. It is due to the wholesale and thoughtless character of town development, and is quite foreign to the traditions of our country ; it results very often in bad municipal government and unfair distribution of the burdens of local taxation, misunder- standing and want of trust between different classes of people, and in the development and exaggeration of differences of habit and thought ; it leads, too, to a dreary monotony of effect, which is almost as depressing as it is ugly. Unwin quoted the traditional English village street where (then) houses of the rich stood alongside the cottage of the farm labourer as an example of the aesthetic benefits of such mixing. Today the concept of mixed and balanced communities has lost some of its lustre because it was not based on such pragmatic considerations but on the theory that was a ‘neighbourhood effect’ on poverty from living in a very poor community. That theory has been blown asunder by research. From a practical point of view Unwin recommends running rods along natural hollows rather than across them to aid natural drainage. Unwins ideas on street bye laws were highly influential. The question of the character of building roads in this country certainly requires much re-consideration. There are two circumstances which have complicated the situation. First, the width of roads has been used, under our form of building bye-laws, to determine the distance between the houses, and as a means of securing a greater degree of open space than would otherwise be obtained. The result is that the widths of roads under the bye-laws commonly in force in the English towns, are not regulated with regard to requirements of traffic, a minimum width for streets is arbitrarily fixed, 40 to 50 feet being usual, and all roads are required to be laid out at least this width ; usually there is no power for the local authority to require greater width, although 40 to 50 feet is as utterly inadequate for the main roads of a town as it is excessive for the purpose of giving access to a few cottages. As a consequence, roads have to be wide-eyed at vast expense to allow for trams and for traffic, while cottages are built fronting to dreary wastes of asphalte and macadam, one half of which could with great advantage be added to their gardens or laid out as grass margin. it is virtually certain that the road will only be used for the d^ly visits of the milkman’s cart and the daily rounds of the coal merchant’s van or the doctor’s gig, it is clear that a well-made track, more of the nature of a gentleman’s carriage drive, with a grass margin on each side, and in some cases a simple gravel or paved footway of narrow width, for use in wet weather, is all that need be demanded. We may laugh today but there is plenty of examples of small private estates which suffice with only gravel roads, where because they arnt through routes and have low traffic they manage. A good example is the Kent House Conservation Area in Bromley which manages despite the roads leading to a railway station. Unwin recounts how at Hampstead Garden Suburb a special Act of Parliament had to be obtained to allow freedom in road widths and laying out roads around open spaces which would otherwise have been impossible, whereas in Letchworth there were no bye laws and so it was possible to experiment with road widths. Unwin talks at length about laying out streets to maximise daylight whilst avoiding excessive summer overheating, as well as layouts in relations to the prevailing wind. In areas where major traffic roads run through residential areas Unwin talks of building most houses faces subsidiary roads to reduce dust noise and small. alas this has been overused especially on characterless and often lightly traffic ‘local distributor roads’ in many sites. Pickles said rebranding was a waste of money – So what does DCLG do? Pickles via his Spad was always keen to highlight wastes of spending by the DCLG such as the 30 odd thousand pounds on designing its horrible turquoise logo. 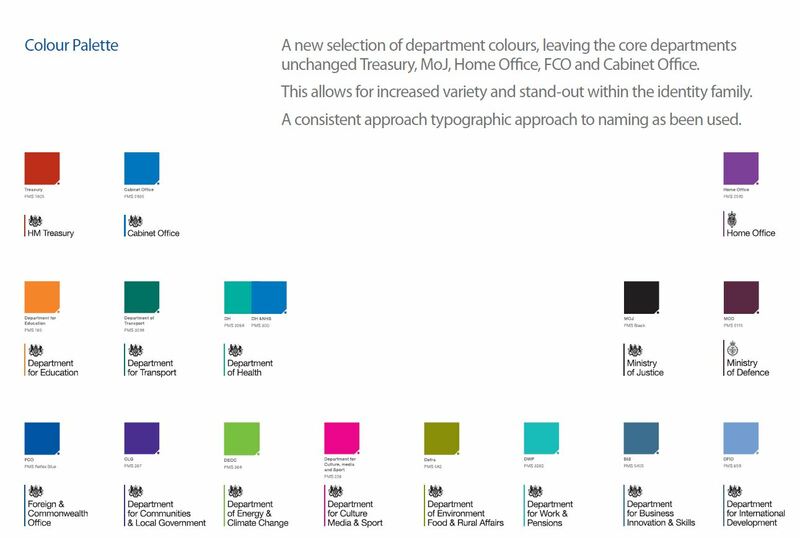 So it will be with some embarrassment for him to learn that DCLG now has a new logo and branding via the cabinet office? One wonders how much it costs. Actually it is rather good, and certainly Adobe Creative Suite inspired. Out with Pantone 3282, and in with Pantone 287, a colour very similar to Imperial Purple, as it was the colour of the incredibly expensive sashes word by roman emperors reproduced at great expense from the gastropod Bolinus brandaris the process hto make it having been recently rediscovered as it was lost after the second crusades sack of Byzantium. Cleopatra was so ostentatious she even dyed her sails imperial purple, at a probable cost of a whole fleet. Rather disappointingly it has been discovered you can obtain the same colour through cockles bought at Tescos. So now uncle Eric can done his departmentally branded costume ahead of this weekends reshuffle (sadly the budgets on the carry on films did not run to getting the colour quite right). Today we’ll cover chapter 5 of Raymond Unwin’s ‘ Town planning in practice; an introduction to the art of designing cities and suburbs‘ of 1909. It is this chapter that sets out Unwin’s ideas on Gateways most firmly, arguably where he has had most influence on urban design practice. that irregular fringe of half-developed suburb and half-spoiled country which forms such a hideous and depressing girdle around modern growing towns. is most necessary in some way to define our town areas, and in the case of large towns to define and separate new areas and suburbs. It would seem desirable to limit in some way the size of towns, but how far this may be possible we have yet to learn. Unwin was speaking well before any Green Belt was defined beyond the scale of that he himself proposed for Letchworth and he himself proposed for London a few years later. Unwin then uses the example of Faubergs built outside of city gates, built in peace but abandoned in war to lend doubt the possibility for highly restrictive containment. we may well doubt whether it will prove possible for us to limit the population of a modern town to a given number, should the town become so prosperous and popular that natural tendency would cause that number to be greatly increased. The attempt would bear some resemblance to King Canute and the flowing tide. There can, however, be little doubt that it is possible to set a limit to the size to which a town shall extend continuously without some break, some intervening belt of park or agricultural land ; and this at least it is most desirable to secure. So here we see the origins of the concepts of regional planning, seeds already sown in Howard’s idea of the Social City, with urban containment not seen in isolation but one component of a policy to manage not twart urban growth. the line of limitation may take many forms. Where woods exist and cannot be entirely preserved, a narrow belt of woodland, just enough to serve as a screen, may be secured, and through it may be taken a path or drive. An avenue of trees requires some years to mature, but a wide grass glade with such an avenue would be in time a most successful feature ; and while the latter trees were growing it might be rendered delightful if planted with fruit-trees or other blossoming trees or shrubs. In large towns or areas it would be desirable to secure wide belts of park land, playing fields, or even agricultural land. In any case, we should secure some orderly line up to which the country and town may each extend and stop definitely, so avoiding the irregular margin of rubbish-heaps and derelict building land which spoils the approach to almost all our towns to-day. These belts might well define our parishes or our wards, and by so doing might help to foster a feeling of local unity in the area. As breathing spaces, they would be invaluable ; as haunts for birds and flowers, and as affording pleasant walks about the towns, free from the noise and worry of modern street traffic, they would give endless pleasure and would in a very true and right way bring into the town some of the charms of the country. A certain concentration and grouping of buildings is necessary to produce the special beauties of the town, and this is inconsistent with the scattering of buildings which results from each one being isolated in its own patch of garden ; but it is not inconsistent with the grouping of buildings in certain places and the provision of large parks or gardens in other places. If we are to produce really satisfactory town effects combined with the degree of open space now thought advisable, we must work on the principle of grouping our buildings and combining our open spaces, having areas fairly closely built upon, surrounded by others of open space, rather than that of scattering and indefinitely mixing our building and our spaces. Unwin even wished to make allotments harmonious through arrangements of hedges, walls and sheds. we must not forget the gateway and the importance of marking in some way the entrances of our towns, our suburbs, and our districts. The character of treatment will be quite different from that of the ancient gateway… but in many ways it would be fitting to mark the points where main roads cross our boundaries and enter towns, or new districts within the towns. For example, some little forecourt of green surrounded by buildings and led up to by an avenue of trees would strike at once the necessary note ; and many other simple devices will occur to the designer for giving the required emphasis and dignity to these points of entrance. But Unwin noted that in modern times far more people will arrive by rail (still true in the centres of most great cities) where Gateways can be created. The great archway at King’s Cross Station has about it such suggestion ; and if an open space in front of it could have replaced the low mean buildings and the narrow entrance lane, where the cabs and omnibuses jostle one another and threaten destruction to the arriving and departing passenger, some little dignity could have been given to this one of London’s modern gateways. Too often, as at Paddington, the station is entirely obscured by the hotel building In front, and the actual entrance and exit is nothing but a mean gangway on each side of, or through, the hotel building ; but one can imagine other treatments of railway stations with ample space in front for traffic, and with the hotels flanking the entrance, leaving the opening of the station with some genuine suggestion of gateway as the central feature. Unwin will have been pleased that the masterplan for in front of Kings Cross is doing precisely this. Lets hope the lesson is learned as well at Euston, where Unwin complained that the design was compromised because the only way for the station to expand was through Euston Square. Unwin also wrote about how to make bridges more gateway like and recommended placing buildings servicing useful purposes in the abutments. David Cameron will hear radical ideas for making Britain’s cities safer for cyclists at a Downing Street conference tomorrow. Architects, planners and designers from around the world will suggest ways to improve overall city design, but cycling is expected to be a key feature. Ideas from Denmark include a ten-storey housing development where cyclists can ride from street level to the top floor, and smart technologies that allow cyclists to save energy and dodge congestion. The “future cities” meeting has been convened by Steve Hilton, Mr Cameron’s strategy adviser. Civil servants are to attend in the hope that the Government and Whitehall can learn the latest ideas from other countries. MPs will debate cycling safety this week, including issues raised byThe Times “Cities fit for cycling” campaign. The urban design conference will serve to underline the appreciation inside Downing Street for Scandinavian policymaking in general and Danish popular culture in particular. Speakers include Bjarke Ingels, a Danish architect whose innovative designs include the “8 House” development in the Danish capital, built in a figure eight, with a cycle path and pedestrian walkway that winds up to the 10th floor. Carlo Ratti, an Italian architect and engineer and senior Fulbright scholar at the Massachusetts Institute of Technology, will talk about the “Copenhagen wheel”. The device, fitted to the back wheel of a bicycle, stores electricity when the cyclist brakes and releases it to help to climb hills. Connected to a smartphone, it can also tell the rider about traffic and pollution. The conference will be told about bike lanes in Copenhagen, on which nearly 40 per cent of the city’s population travel a total of 1.3 million km every day, giving it the unofficial title of most cycle-friendly city in the world.